People got really interested in low cost small factor Intel devices at the end of the year, and one of my article about MeegoPad T01, an HDMI TV Stick powered by an Intel Atom Z3735F processor, even made it to the top 10 posts of 2014 on this blog. But instead of simply relying on partners, Intel had decided to enter the fray with Intel Compute Stick that will run Windows or Ubuntu on an Atom Bay Trail processor. 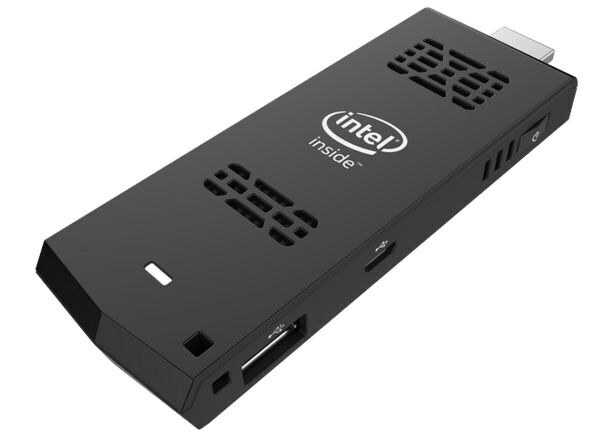 The Intel HDMI sticks will start selling in Q1 2015 for $149 for the Windows 8.1 version, and $89 for the Ubuntu version. More details should eventually shown up on Intel Computer Stick product page. Wondering if on the 2 gb with 32 gb emmc version Linux is usable or is windows only. Has Z3735F decent linux gpu drivers? PowerVR inside, right? matt, it has Intel HD Graphic. As expected. Just shows how more efficient Linux is. You probably not using Chromium or Firefox. If one use an advanced desktop like Gnome and a full featured browser like Chromium then 2GB is the bare minimum and 4GB is highly recommended. For Kodi/OpenELEC then 1GB is more than enough. It looks nice but no gigabit Ethernet, no sale. So, how did this go? Intel provided a reference design for such quad-atom sticks to manufacterers, with an embargo until Jan 7 (CES), and the Chinese manufacterers broke the embargo? Does this mean Intel will bring 32bit EUFI support to Ubuntu? Or have they changed their mind with recent Atoms? @vpeter , Intel has been branding PowerVR as Intel graphics in many of their low-power Atoms for years. Bay Trail was the first generation that had **some** models coming out with Intel’s own graphics hardware, but the SoC versions in phones and tablets (and likely this stick) are still PowerVR. The PowerVR graphics found in Atom SoCs rarely work well on Linux.